Recognizes DrugBank ID and some common drug names. Recognizes ID from DrugBank, UniProt, GenAtlas. Data on protein-drug interactions are rapidly increasing and being collected in databases such as DrugBank. 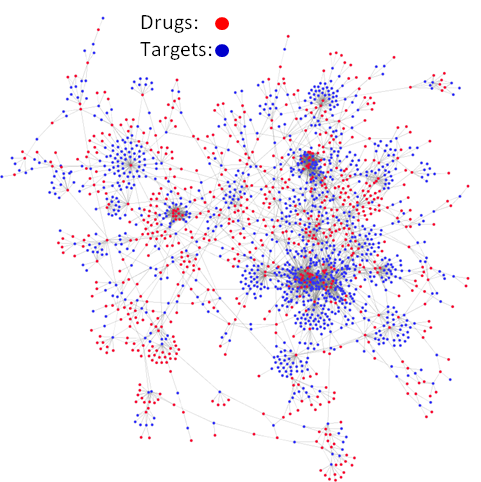 The information in these databases usually reflects known/observed interactions, while the lack of data for a given protein-drug pair does not necessarily mean that those protein-drug molecules are not interacting. Indeed, recent studies supported by both computations and experiments indicate that many drugs have side effects (i.e. they target proteins) other than those known/compiled in DrugBank. This latter property may be exploited for designing ‘repurposable’ drugs or polypharmacological treatments. Efficient identification of such potential interactions is an important challenge that is likely to accelerate drug discovery and development efforts. There is a need for efficient identification of such data, and efficient dissemination of results. Built by: Murat Can Cobanoglu. Designed by: MC Cobanoglu, ZN Oltvai, DL Taylor, I Bahar. Citation: MC Cobanoglu, ZN Oltvai, DL Taylor, I Bahar. (2015) Bioinformatics 31, 131-133. Funding: Support for BalestraWeb development is provided by NIH awards U19 AI068021 and P01 DK096990.